I think that’s a pretty accurate term! Hello, and welcome to those of you joining me today as part of Gnome Angel’s Dilly-Bag-A-Long. When I first signed up, I asked to be right at the end, because, as you regular folk will know, we’ve just come off what is affectionately known as birthday season – a five week span of all four of our children celebrating birthdays. No fear, says I, I can sew in between, and catch up and be done before October 15. Not a worry in the world. As of 4pm yesterday afternoon. Yay me!! I am using some Vintage Modern pieces left over from another project, and after fiddling with the layout a bit, decided to go with a colour-blocked style of layout. And horizontal pin-tucks on this blue one. The lining I am thinking of doing as a patchwork of my leftover scraps, or possibly just picking one of my favourite prints and using that. I’m undecided – I’ll wait until the hexies are all together and audition my options. 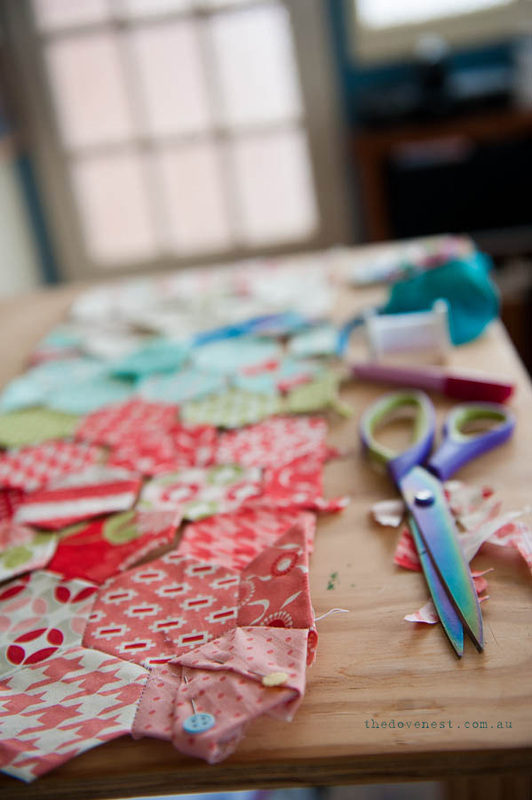 I also had hoped to have a short video and a bit of a tutorial on English Paper Piecing to share, but first my camera and then my computer didn’t want to play nicely, so it will have to be a post for another day. How’s your dilly bag going? I’d love to see your progress on it, or on any project you are working on at the minute, just link up your blog post or instagram photo below! Thank you!! 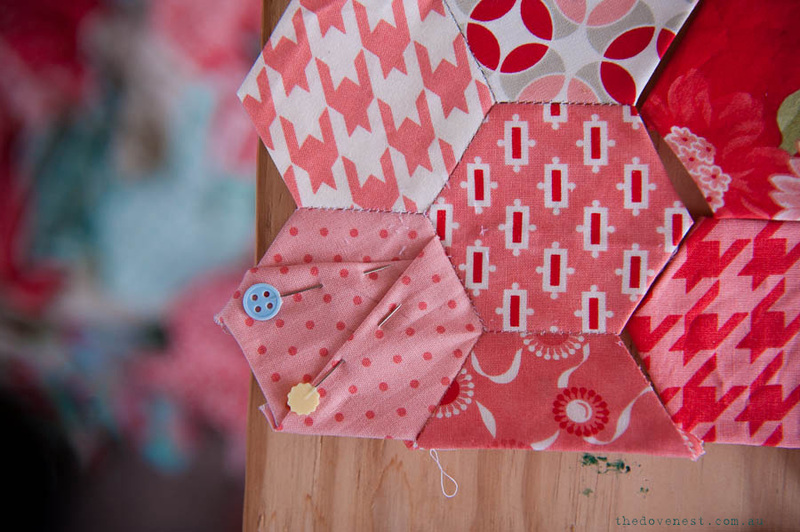 I’ve nearly got all the hexies done – tomorrow I assemble! I WILL be done by Friday! Thank you! I’m growing very fond of them very quickly too! Such a fabulous little hand project. Omg – pleats on hexies!! Way cute- I love that idea! Thanks, I was really happy with how they turned out! Wow! 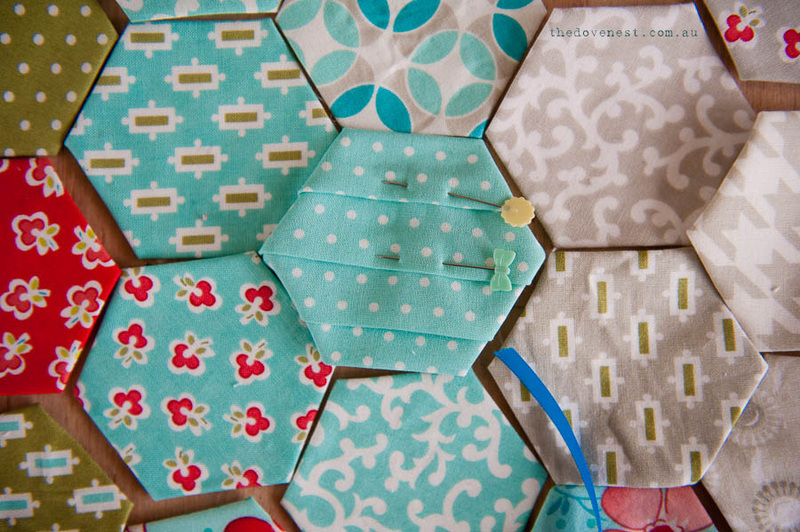 Very impressed with the pleated hexies, I’ve never seen that done before. Your bag is going to be lovely. Thank you! It was a random flash of inspiration, and I’m so pleased with how it worked out – I definitely think I’ll be doing it again!